"Look at me. You're a Stark of Winterfell. You know our words." 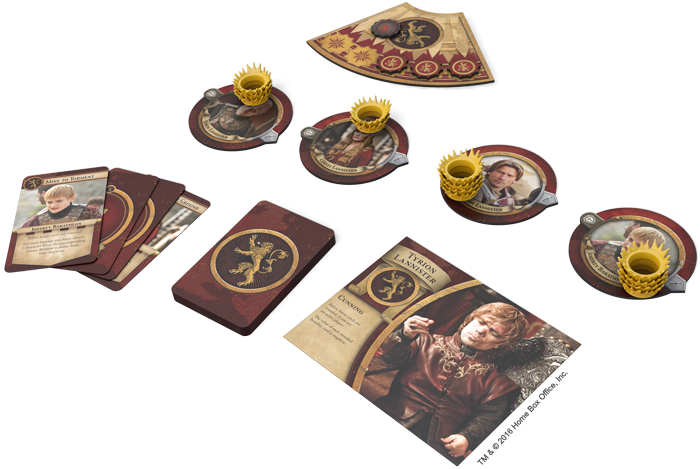 With all of its intrigues, battles, and betrayals, Game of Thrones: The Iron Throne allows you and your friends to transform your board game night into something very much like an episode of HBO's Game of Thrones. You have the requisite struggles for power. You have conflicts at all turns. You have opportunities for peaceful negotiations… and some of these may actually result in truces. Of course, many more will invariably end with betrayal and a knife stuck in someone's back. 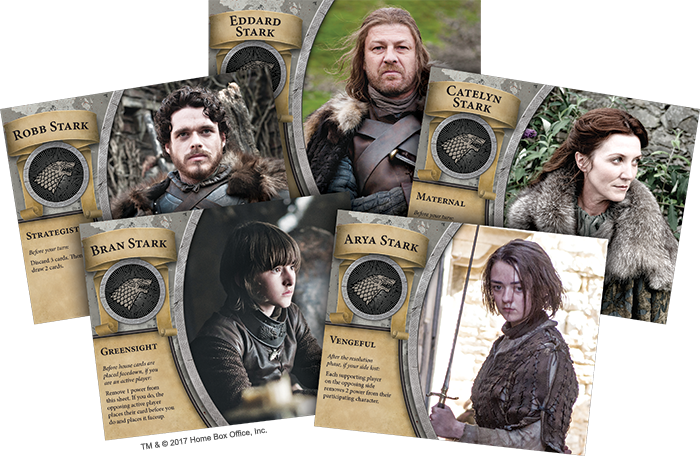 And to further ground your struggles within the world of Game of Thrones, The Iron Throne invests each of its leaders and character cards with abilities that evoke the show's themes and events. 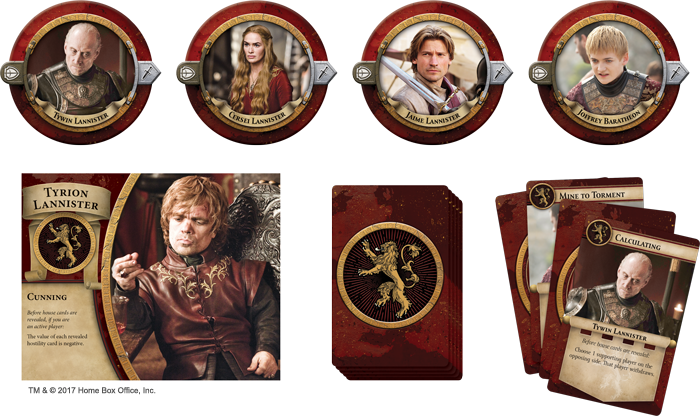 What's more, the collections of these abilities define the game's Houses, and when you play The Iron Throne, you're not just trying to rule Westeros as some generic collection of tokens and abilities, you're representing the Starks, Lannisters, Baratheons, Tyrells, or Targaryens. Hailing from the North, the Starks are grim and serious. 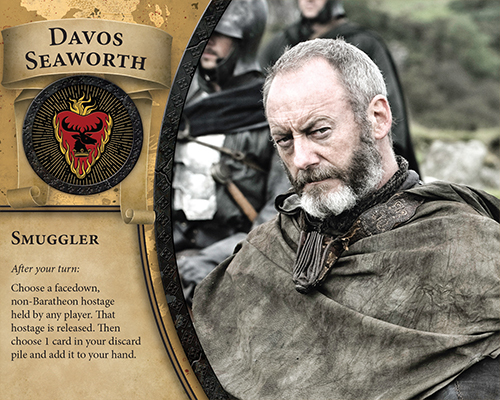 They recognize the threat that Winter represents and have little time for King's Landing and all its intrigues. Instead, they focus on preparation and duty. 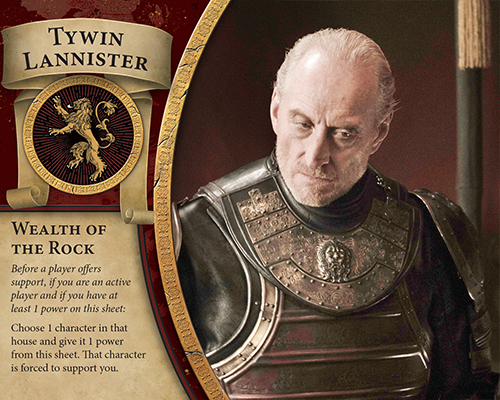 The Iron Throne brings these Stark traits to life in their leader sheets. 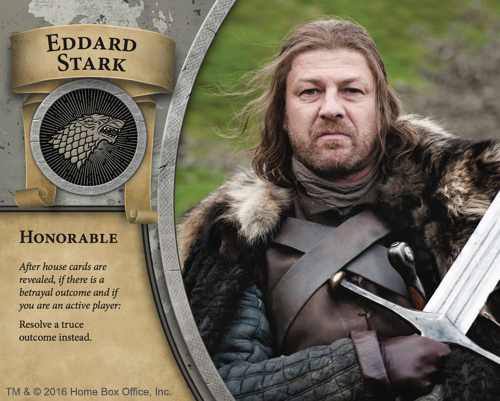 Eddard Stark can remove much of the guesswork involved in a conflict by forcing it to resolve as a truce whenever he plays a Truce card. 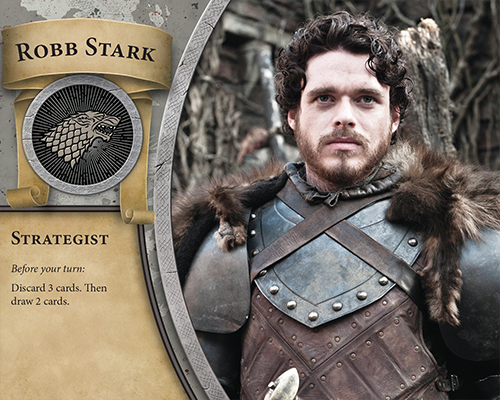 Robb Stark demonstrates the value of preparation with his ability to draw for the house cards he wants to play. 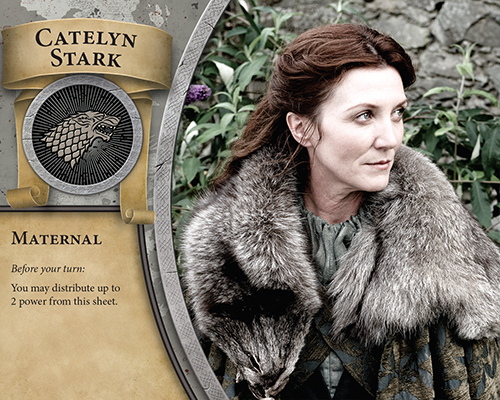 And Catelyn Stark tends to her duties as a mother by ensuring her children will receive they power they need to succeed in their struggles. 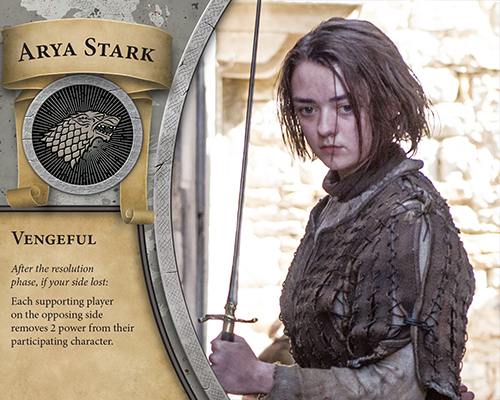 While the Starks excel in straight-forward encounters, they struggle when mired in intrigues. 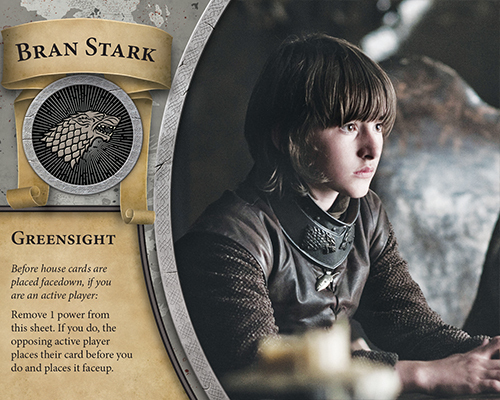 Only Bran Stark , with his Greensight, offers a Stark player any means to disrupt the natural resolution of events. However, Arya Stark reminds us that even if it's possible to fool and betray the Starks, it's not always the safest path to take. Like the North, the Starks tend to remember those who betray them, and they will have their revenge. The Lannisters of Casterly Rock have taken the lion for their sigil, presumably to illustrate their pride and power, both of which they enjoy in abundance. While the Lannisters of The Iron Throne gain no special bonus to represent their House's wealth or armies, several of their leaders are, nonetheless, able to use their power and influence to manipulate their rivals. 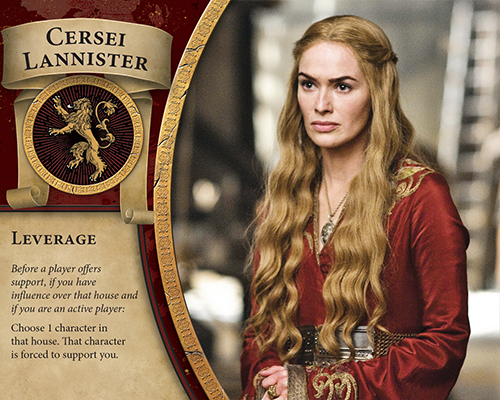 Cersei Lannister can demand the support of any character belonging to a House over which Cersei has influence. Tywin Lannister doesn't even need to have influence over another player to demand the support of one of that player's characters; he can simply give it a power to win its allegiance. 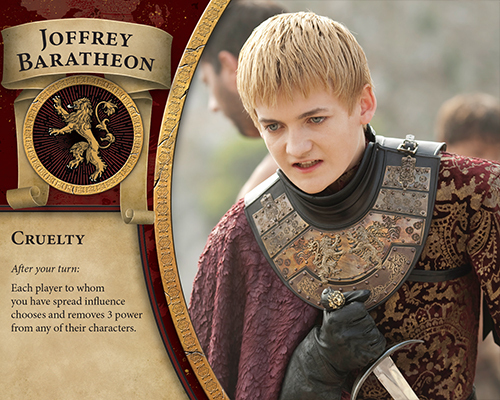 Despite his name, Joffrey Baratheon is a Lannister through and through, and it shows in his ability, which allows him to strip power from the rivals over whom he has influence. Finally, as in the show, Tyrion Lannister is a bit different from the rest of his family. 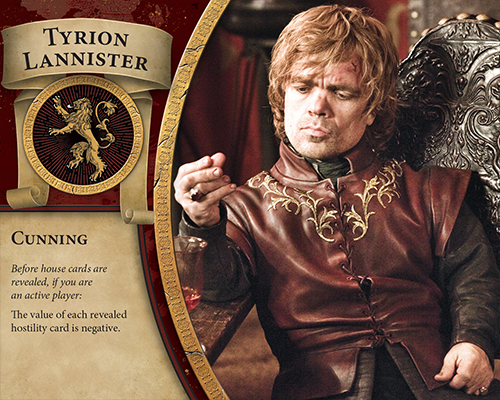 With his Cunning, Tyrion turns the game's conflicts upside down, fighting them with his mind, rather than his sword. 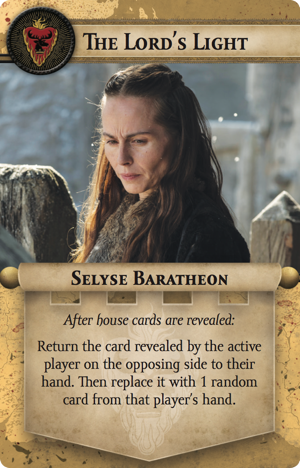 Before he and his opponent reveal their house cards, Tyrion can make them subtract their values from their sides' power totals, rather than add to those totals. 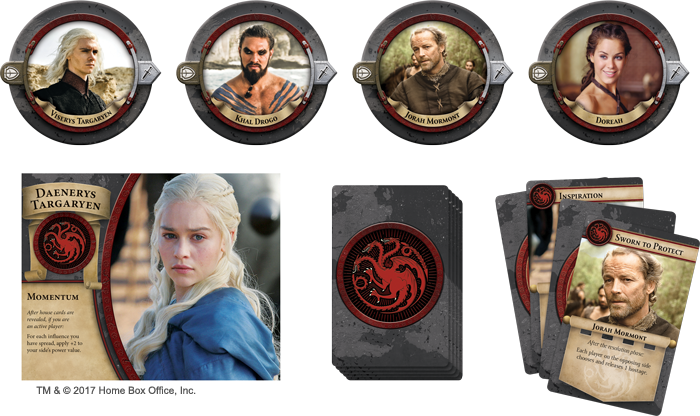 And since all leader abilities are optional, Tyrion's ability can force his opponents into some truly bewildering situations where they are constantly forced to guess whether the house cards in the conflict will be beneficial or detrimental to their efforts. 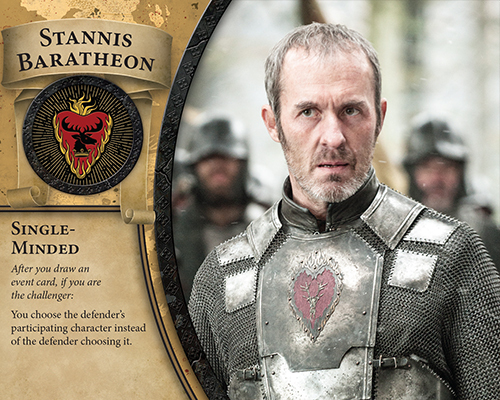 The Baratheons of The Iron Throne are represented by Stannis Baratheon and those who backed his claim to the Iron Throne after he contested the legitimacy of Joffrey's birth. Accordingly, they are driven by what they see as the righteousness of their claim. Others might view their behavior as obsessive and fanatical. 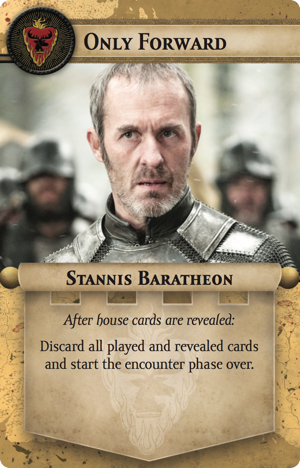 Regardless of how you see the House, you'll find touches of both righteousness and fanatic zeal among their leader abilities, starting with Stannis Baratheon , whose singular focus allows him to choose which of an opponent's characters must face his forces in any given challenge. 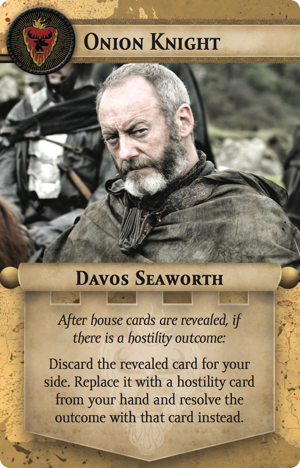 Clearly representing the "righteous" side of the House, Ser Davos Seaworth is willing to release his opponents' hostages in order to reclaim house cards from his discard pile. 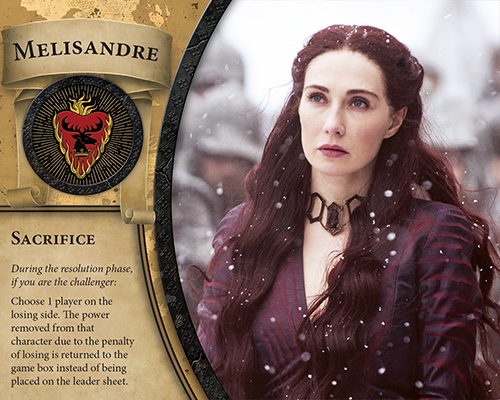 And for "fanatical zeal," we have Melisandre , whose ability allows her to effectively burn power, sacrificing it to the Lord of Light. Notably, her sacrifices may be either her opponents—when her side wins—or any allies that support her—should her side lose. 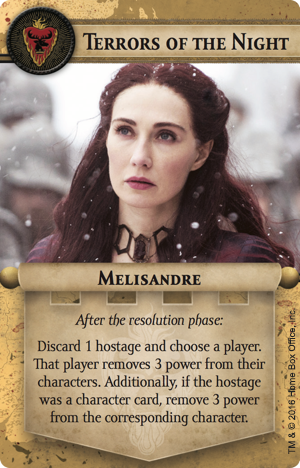 And while the Baratheon's leaders balance righteousness against religious fervor, their house cards balance faith against tactical discipline. On the side of faith, you have cards like Terrors of the Night and The Lord's Light , which push for greater sacrifices and trust in the Lord of Light's ability to undermine your opponents' schemes. On the side of tactical discipline, Onion Knight and Only Forward offer means of outmaneuvering your foes. Even though the power-hungry Tyrells boast some of the boldest House words you may find, their leaders are, nonetheless, some of the subtlest players in King's Landing. 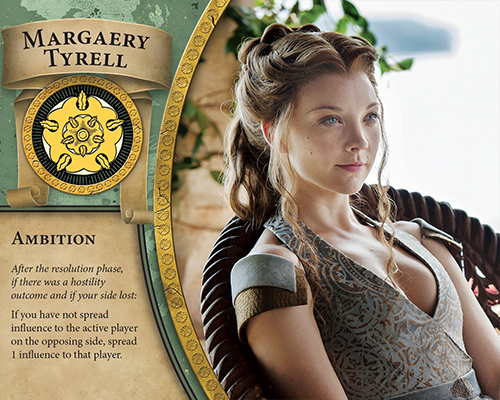 For starters, you have the Devious matriarch Olenna Tyrell , whose leader ability matches Tyrion's in terms of the mental acrobatics it forces upon your opponents. 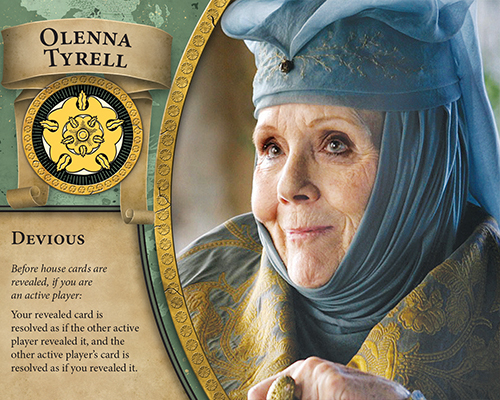 After house cards are played, but before they are revealed, Olenna allows you to switch your card with your rival's. Will you play a low strength house card in a vital challenge, planning to switch it with your opponent's? 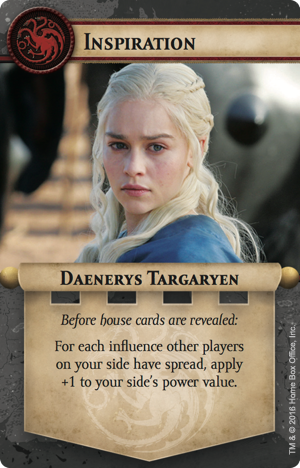 Or will you play a high strength house card, expecting your opponent to expect you to switch? 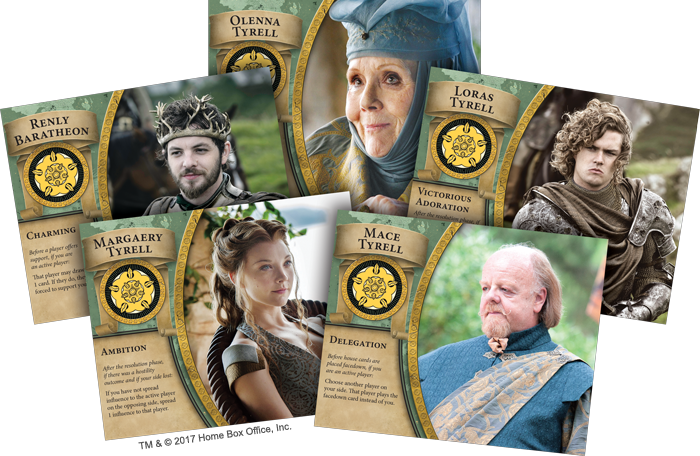 Either way, Olenna's ability allows you to sit back and smirk at your opponent's headaches, and it might even put you in a better position when you offer a truce. Likewise, since Margarey Tyrell's leader ability allows you to spread influence even when you participate on the losing side of a challenge, she may discourage your foes from hostilities. Additionally, Maragery's ability may earn her a warm welcome from any House that you lend your support. Since you don't need to be an active player to trigger her ability, she discourages your opponents from declaring hostilities even against your friends. And, finally, although Mace Tyrell may not be the brightest of the Tyrells, his leader ability still plays to the House's subtle style in challenges. 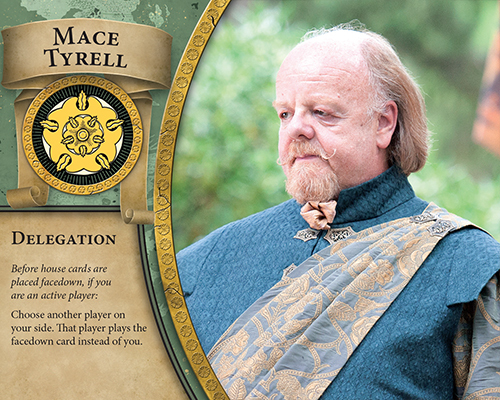 By delegating the play of house card to your ally in a challenge, Mace Tyrell effectively doubles, triples, or even quadruples the number of House cards available to you and your allies. 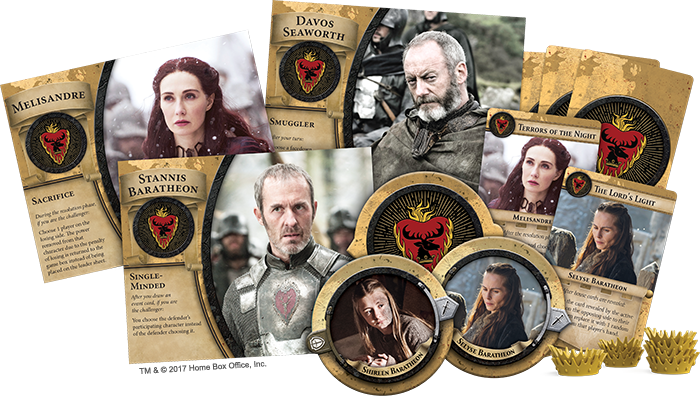 And, in the end, you retain all your house cards for future challenges, when you're closing in on King's Landing and have greater need of them. Last, but certainly not least, the Targaryens bide their time in Essos, building their strength toward that moment that they'll cross the Narrow Sea and take King's Landing in a storm of fire and blood. While House Targaryen's five leaders' different abilities may appear to start down vastly different paths, they all lead toward a long game aimed squarely at the Iron Throne. 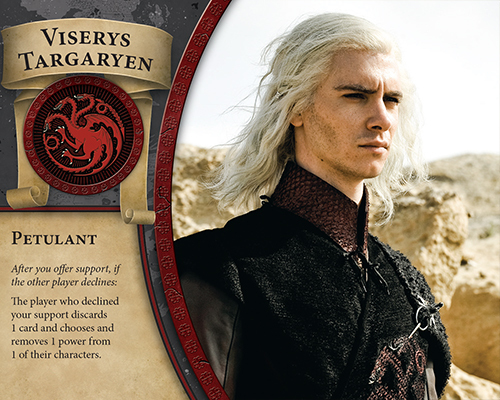 Even the Petulant Viserys Targaryen becomes a force of uncommon resolve over the course of time—slowly and steadily forging alliances according to his desires, or divesting those who refuse him of their power. 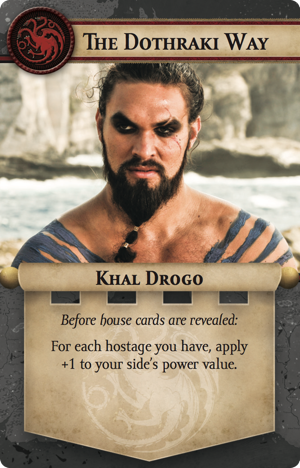 While few may accuse of Khal Drogo of long-term planning, anyone who amasses enough victories can gain power worthy of notice, especially if he's able to parlay his hostages into vital power at the appropriate moment through the use of The Dothraki Way house card. Of course, no one among House Targaryen is more recognizable than the Mother of Dragons, Daenerys Targaryen , and her ability perfectly summarizes what House Targaryen is all about in The Iron Throne—building your strength toward an inevitable and irresistible clash with the other Great Houses. 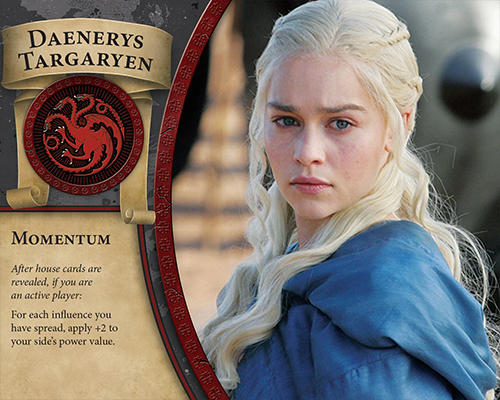 By the time she's trying to win her fifth power, her Momentum will grant Daenerys eight bonus power in each challenge, and every point of influence that her opponents have placed upon her side will serve only as Inspiration to lift her even higher. Which House will you support? 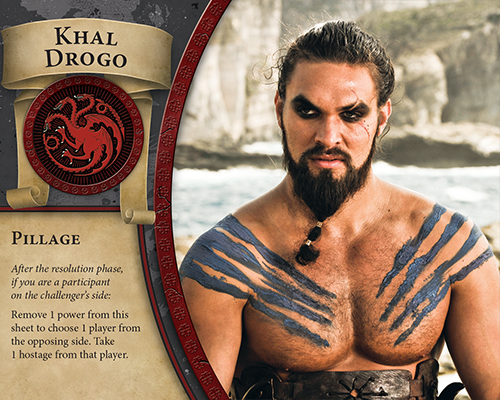 Each House—and every leader—in The Iron Throne lends itself to a different style of play, meaning your games are constantly taking on new flavors and intrigues. The only constants are the inevitable deaths, hostages, and betrayals. See for yourself how The Iron Throne transforms your game night into a new episode of Game of Thrones. The Iron Throne is available now at retailers everywhere. Pick up your copy today! 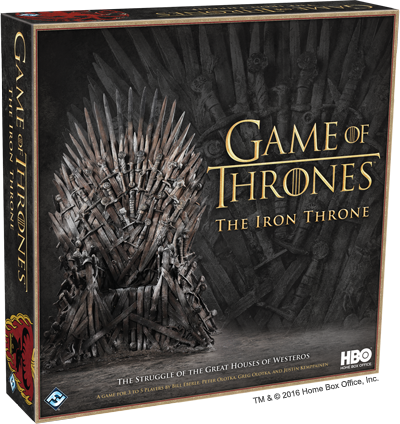 Game of Thrones: The Iron Throne is a board game of intrigue and betrayal for three to five players based upon the thrilling HBO series and using game systems from the legendary board game Cosmic Encounter®.